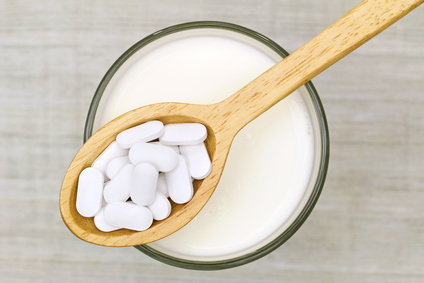 Calcium supplements and constipation-take smaller more frequent doses. When dealing with calcium supplements and constipation, the body is only able to absorb about 500 mg. of calcium at a time. Whatever calcium the body doesn't absorb continues on to the colon. Once there, calcium tightens the colon muscle. The colon is like a pump. It works through a rhythmic contracting and relaxing to move stool along. When calcium causes an overall tightening of the colon, it's "pumping operation" is hindered, resulting in constipation. Therefore, for best absorption, it is best to take smaller amounts of calcium throughout the day. For instance, if you feel you need to take 1200 mg. a day, try taking 4 doses of 300 mg. each. A calcium tablet can be broken into smaller pieces to help with this. It is especially helpful to split up the dose when a doctor recommends a large daily dose of calcium for those with osteoporosis or who are pregnant. It may seem that if you want to absorb calcium, you should simply take more calcium. However, it doesn't work that way. When a person takes to large of a dose of alkaline minerals like calcium and magnesium, it becomes necessary for the kidneys to dump some to maintain chemical balance. This brings us to our next point. Since they are both alkaline, taking calcium and magnesium together makes them compete for absorption. So it is especially important when taking a Calcium/Magnesium complex to take smaller doses. Most Cal/Mag supplements are 2 parts calcium to 1 part magnesium. Therefore, to increase absorption, it is best to take a maximum of 400 mg. calcium and 200 mg. magnesium at one sitting. Calcium and magnesium can hinder the absorption of medications, so although it may be inconvenient, it is best to allow 2 hours between taking them and any medications. Magnesium helps the body to relax. I have had numerous individuals tell me that they have cured their sleep problems simply by taking Ionic Sea Minerals (which contains 422 mg. magnesium per tsp.) before they go to bed. It isn't necessary to take calcium and magnesium at the same time. As long as they are taken the same day they will still balance each other out. It is therefore just fine that so many individuals choose to take a magnesium supplement in the evening. One advantage of this is that the magnesium works all night in the lining of your gut, with the advantage of an urge to go shortly after getting up in the morning. The first drawback to taking magnesium before bed is that you may have to get up during the night to urinate. I loved taking my magnesium just before bed, but didn't care for the extra trip to the bathroom. Second, some individuals have reported taking magnesium before bed and then having diarrhea during the night; sometimes it even happens before they can wake up to stop it. Now I take my magnesium when I first get up, and usually get that urge to go half way through the morning. By taking a magnesium supplement, most people can say "goodbye" to the calcium supplements and constipation effect.